The yellow flag came out on lap 211 for Ana Beatriz’s accident and that untimely yellow stole any chance of victory for Takuma Sato. Piloting the No. 14 ABC Supply Honda, Takuma Sato was the class of the field for most of the Milwaukee IndyFest but n untimely yellow flag cost him a chance at victory at The Milwaukee Mile Saturday afternoon. Sato started 15th and dropped back at the start letting the engineers know that the car was loose or suffering from oversteer. When the yellow came out on lap 21 for Simona DeSilvestro’s contact with the Turn 4 wall, Sato pitted on lap 23 to make a wing adjustment and take on fresh tires. The adjustment worked because he began slicing through the IZOD IndyCar field, and by lap 69, he had taken the lead for the first time. Sato drove away from the field and even after pitting on lap 91, he was in command again by lap 100 of the 250-lap race. He pulled away from all challengers and wasted no time regaining the lead after another stop on lap 157. He was dominating the competition running high or low, whatever he needed to do to get around traffic. The car appeared to be hooked up on rails. Until it wasn’t. With no warning, the car got loose and wiggled as Sato was coming through Turns 3 and 4 around lap 190. The car drifted into the gray area of the track nearly brushing the wall. Sato kept it off the wall and in the lead although he’d lost quite a bit of his margin to Helio Castroneves who was running second. 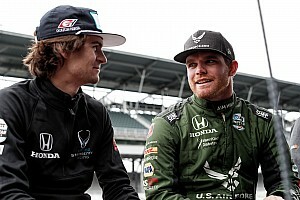 He was so quick that he had lapped everyone up to seventh place Scott Dixon. However, whatever had caused that wiggle didn’t go away. Sato radioed in that he thought he thought something was wrong so the team pitted him early to give him fresh tires on lap 200, 12 laps earlier than they had planned. Unfortunately, the yellow flag came out on lap 211 for Ana Beatriz’s accident and that untimely yellow stole any chance of victory. Six drivers were able to pit under yellow on lap 213 and come out ahead of Sato on the track. The fact that they had fresh tires at a track where it was difficult to pass sealed his fate. Moreover, in that final stint, the car was not handling like it had earlier. The ABC Supply crew will be tearing down the car this week to sort out the change in handling which may have been caused simply by the changing track conditions in the latter part of the race. 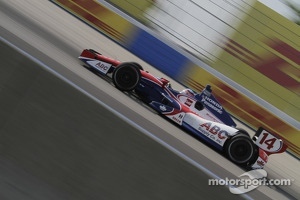 Despite the setback, Sato gave AJ Foyt Racing its best finish at The Mile since 1988 when Foyt himself finished fifth. It was also Sato’s best finish in four runs at the flat mile oval. The ABC Supply crew turned in four flawless pit stops ranging from nine seconds to 7.4 seconds. Sato’s performance netted him enough points—including the two bonus points for leading the most laps--to move to fourth in the IndyCar standings. With 950 guests of sponsor ABC Supply attending the race (including chairman Diane Hendricks), Sato gave them something to cheer about as he paced the field three times for a total of 109 laps. Sato was philosophical about the outcome but his disappointment was sharp as he had come so close to winning his second race of the season. “What an eventful and exciting race it was,” said the Tokyo native afterwards. “We slowly started to move up through the field and on every pit stop we adjusted on the car and then the car started working really well. By mid race the ABC Supply car was beautiful and I was so enjoying driving it. The car was so strong in clean air and very strong in traffic as well. Unfortunately there was such a sudden loss of rear grip towards the end of the race and I got high and lost track position. We thought there was an issue so we decided to pit as soon as our pit window opened and then try to charge back with fresh tires. We were confident we could do it. 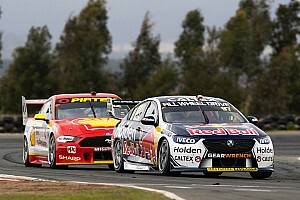 But then the yellow came out and that was very bad timing for us because it put us behind those who hadn’t pitted yet. They were able to pit and get ahead of us which is why we lined up in 7th. Then they had fresher tires too so it was really tough to pass them back. A.J. Foyt, at home in Houston because of severe pain in his left leg which doctors will examine on Monday, watched the race on TV. Indeed, Sato’s and the ABC Supply team’s performance did put a smile on his face. “They did a helluva job today. I am really proud of them,” he said. Ryan Hunter-Reay won the event with Castroneves and Will Power joining him on the podium. Rounding out the top six were E.J. Viso, James Hinchcliffe and Dixon. The team will head straight to Iowa for the Iowa Corn Indy 250 on the high-banked, 7/8-mile Iowa Speedway. Sato and several team members will be stopping in at ABC Supply’s headquarters in Beloit, Wis. on Thursday to attend the annual company picnic. It will be Sato’s first visit to Beloit. That evening they will continue on to Newton, Iowa. For the first time, there will be a double qualifying procedure. The cars will qualify on Saturday with time trials, after which the cars will be entered into one of three heat races. The finish of those heat races will determine the starting order of the field. 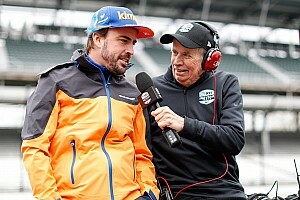 The race will be broadcast live on ABC-TV Sunday, June 23 starting at 2:30 p.m. ET.